There’s always a sense of anticipation for me but also one of coming home. Of having been elsewhere and existing, but this is the real world: a Pow-wow, wherever it happens to be. I feel a sense of purpose and relief seeing so many of the People together. I see the faces of my relatives and ancestors now gone in the faces all around me whether I know them personally or not. There’s Uncle George, and Bunch and Locket, Uncle Kenny and Randy and the most beloved and dearly missed, the great grandmother we all called Big Mama, which we now call my own mother. (The story of her passing can be found here, Big Mama’s Pears: A Memory. )Though long passed I see their faces around me. I feel their spirits. Just beyond the corner of my eye I see all the spirits of the people who’ve ever lived and died breathing and moving, just like our own: glances turned inward towards the circle we all surround. The drummers gather around their sacred drums, clear and massage their throats, test a few beats here and there. We all hold ourselves motionless yet quiver with excitement. 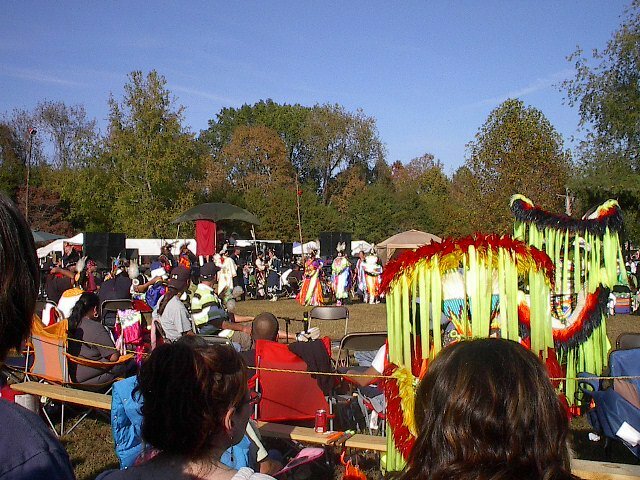 Then it begins, and with a wordless cry we release our energy as our hearts pound fiercely with the rhythm of the drum. We’ve come with friends today. Hell, we always come with friends and be among others even if we don’t personally know them. My people are Chiricahua Apache and Cherokee, my companions are Lakota from Rosebud rez, living in Hot Springs, South Dakota, another is also Chiricahua but mixed too with Blackfeet and Eastern Cherokee. Most of us are older, or as in my case struggling with our health, but we walk the long dry walk from the car park resting a few times along the way, but it’s a short walk really. Infinitely less than the deadly march some of ancestors were forced to walk. 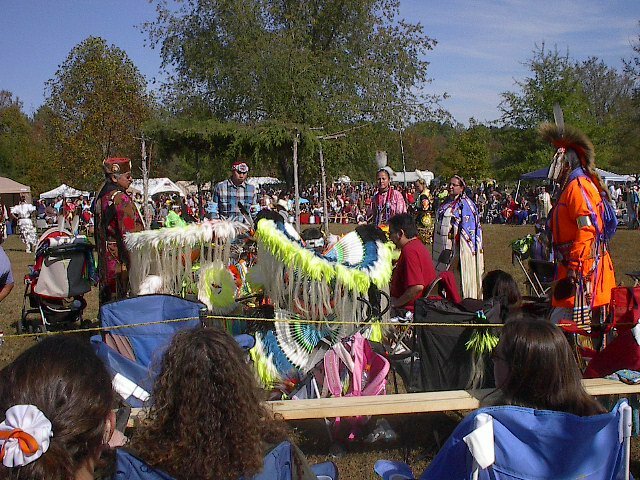 This is a larger well-known pow-wow for this area in Tennessee, the 29th annual one held at Long Hunter State Park. Perhaps it’s officially part of Nashville this state park but it must be out in the wilderness section near the many laked portions. My point is it gets a lot of visitors who are non-Native. As we’re walking up there’s a new American grandmother with her small grandsons. One points at my mother as exclaims, “Look Granny, there’s an Indian!” “Yes”, she replies, “that’s a real Indian!” My mother laughs. My son is somewhat indignant and says one of his favorite phrases, “That’s racist.” I reply in the negative. “Well, it’s stupid, anyway!” Next favorite statement. I reply in the negative again. We make a few more steps. “They should know better!” my son finally concludes. “Then teach them,” I finish. Usually we rather randomly find a spot to set up our chairs, or if we have a canopy, but since my friend’s father is visiting, a Lakota elder, we follow him. He looks aimless and we wonder why he keeps moving on, but he settles in an excellent spot after all and still the doubting questions on our tongues. At that time of the day, around one p.m., the sun is glaring in a cloudless skies. To my eyes edges are too hard and defined. It makes my throat feel overly dry. I’m tired already but I don’t want to sit down. My son doesn’t want to for another reason. Along with Mizz Suzy, my friend’s seventeen year old niece whom my son thinks is prettiest most petite thing he’s ever seen, they want to go shopping at the many booths offering goods of all kinds related to or made by natives. “As long as you bring me back something to drink, run off,” I allow. 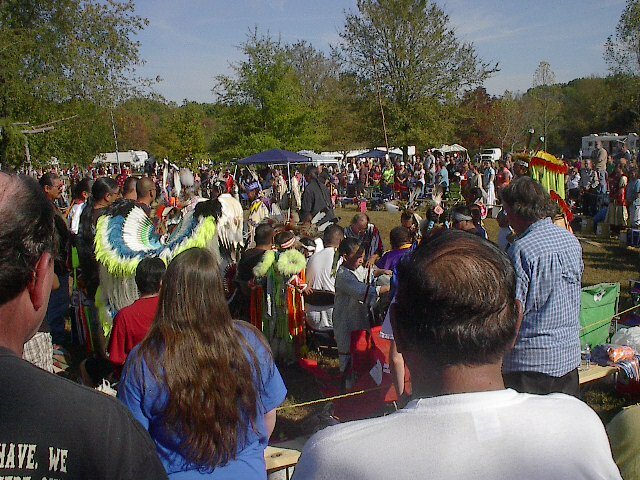 Grand entry begins and it’s respectful to stand the whole time although it takes often several minutes. Doesn’t matter if my heart burst, I’d keep standing until I fell. You just have to be tolerant, you have to be what you are, which is not easy to be offended, or quick to anger when people take photos when they’ve been asked not to, or talk loudly on cellphones about their class schedule for next week during a very special healing song, or their children say how bored they are over and over again, LOUDLY. None of that matters, and in the end it’s ok anyway. At half past two and onto three most of the non-Native crowds have already drifted off or the ones left behind have been to pow-wows before. They are respectful, cheerful and quiet for the most part. They are enjoying what we are though perhaps for a different reason. 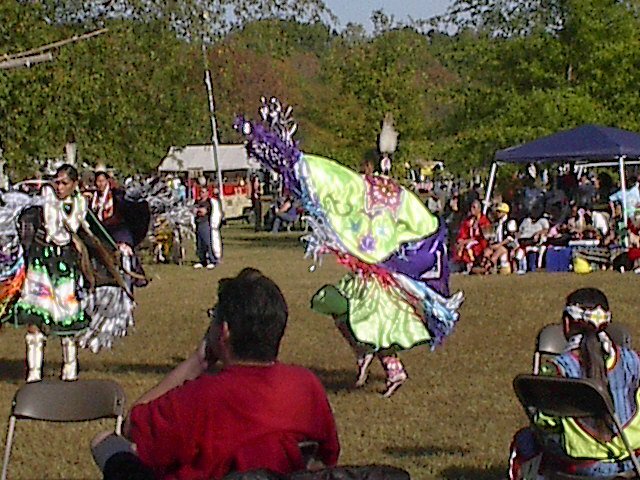 Grass Dance is my favorite. 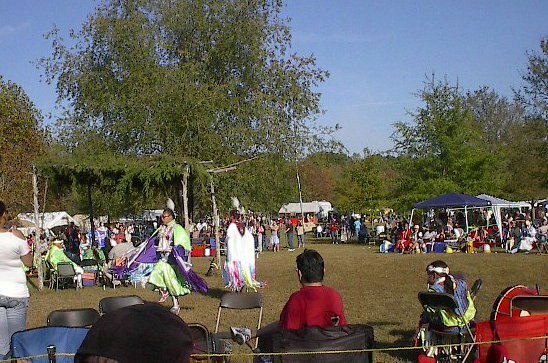 I love the story behind it, the movements of the dancer, and I wrote about it before in my entry: “Writing is a Grass Dance, Welcome to my Pow-wow”, if you’d like to read it follow the link beneath. But it’s the Jingle Dress Dance that chokes me up. For those who don’t know, it is a special day as close to holy (in the modern sense of the word) that I can feel. Each woman’s regalia has 365 bells on them, depending on their level and ability, one for each day of the year. A prayer for each day. A prayer for each of us. They dance for us and they offer up the prayers. It is sacred. In times of healing, times of birth, or struggle or death, this is the dance that comes back to me. I am a Two Spirit. I am in between. When my cousin went into labour three months too early my mother sent me onto the hospital for then I could move faster than she. I danced this dance in her room while the nurses looked at me askance but my cousin relaxed. Her feisty little girl child calmed down a bit and waited to be born a few days more. She lived. 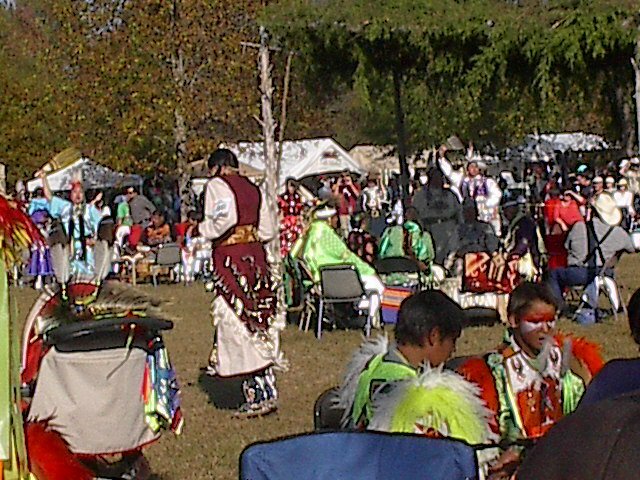 The Jingle Dress is our prayer. 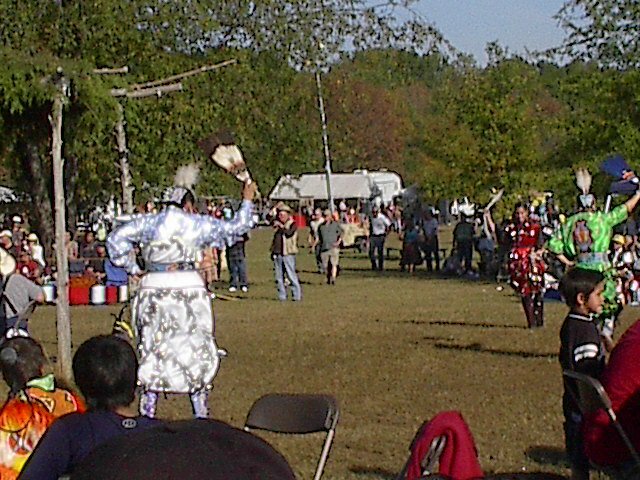 This year there was a special one danced and drummed as an elder had cancer. As many as possible stood around the drum and the dancers….there’s no way to explain it really. You have to feel it. We of us all know the steps, the movements. We’d seen them dance earlier in the day a few times, but this time it was more fierce, frenetic yet infinitely focused and controlled. The light jumping of the bells as they moved sparkled and winked, made brighter by the force of emotion and strength of the sun. There were few dry eyes among the People when it was finished. My eyes are filled with tears even now. All the ones who’ve gone before, who are passing over….But you don’t stop dancing or like me, you can only dance in your mind but it is an intense feeling, a driving need. Your chest just expands and expands, and in my case, you have to give a cry. It’s instinct. It’s nature. It simply is. That’s the way of it. It’s rounding toward four p.m., and the light has softened. The reddening and golden leaves glow with the gentling sun’s rays. The stands are quieter, less movement all around. The sense of the gathering grows more intimate for it’s primarily natives now. The dance contests continue and there’s a “drum off” in the works to break the tie to see who’s the best drum, and I’ve totally forgotten I am suppose to be at work in about an hour. An hour. It’s a two hour drive minimum from where we are in Tennessee back to our home and my client’s location, yet I’m still reluctant to leave. Torn between the fact I forgot my cell and could have called and cancelled and that would have had to eat take-away food, (I am a full time private chef), and the reality there is no choice but to start the journey homeward…I begin my good-byes to my friends. My mother begins to question me. I hold up a hand. When I move away simply move with me, I listening now. She quiets. The birds are wheeling in the heavens above us as a new song begins, a Fancy Shawl dance. I keep my gaze upward to the deepening blue sky but still flashing below are their bright colours. I close my eyes then and everything still blazes behind my eyelids. I can feel the vibration of the earth beneath my feet, the heat of those standing close by, hear even beneath the sound of the music and voices the steady breathing of the People. It’s all of a piece, of a necessary piece and part of my life. When I open my eyes the world seems to tilt and things are brighter and sharp-edged again. Back to the outside world. My steps move away. Wordless my mother follows, then my son. Posted in Native American, Personal Entries, Photos. Tagged family, friends, gatherings, indigenous people, memories, music, native american, native american life, pow-wows, tennessee.